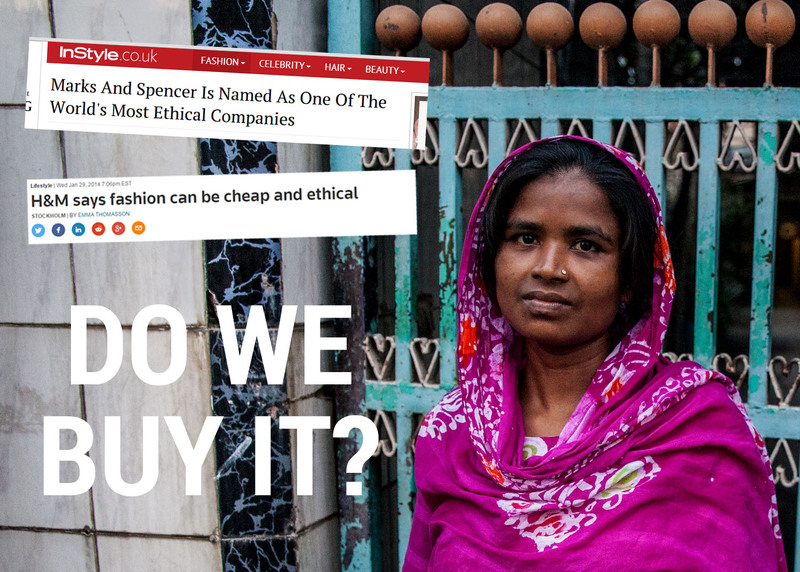 Have you ever wondered if the public statements high-street brands make about their ethics are backed up with facts? 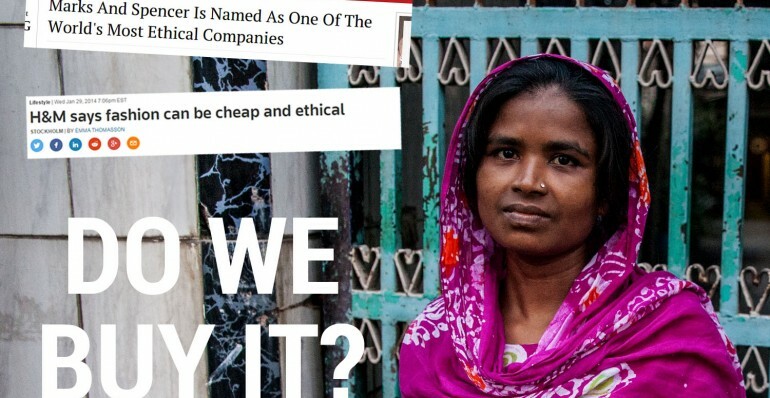 Our new report, ‘Do We Buy It?’, looks into the stories behind two leading high-street brands who have made claims to be ensuring a fair living wage is possible for workers who make their clothes. Marks and Spencer (M&S) set out publicly in 2010 a plan to ensure that, by 2015, suppliers in India, Sri Lanka and Bangladesh would be able to pay a ‘fair living wage’ to workers. H&M similarly launched a fair living wage promise in December 2013, aiming to have a system in place to allow workers to be paid this ‘fair wage’ by 2018. Both M&S and H&M are receiving public recognition for these claims, (not least from Labour Behind the Label in terms of high marks in our reports!) but can we trust what they say? Our research set out to find if M&S’s scheme had been effective, and if H&M’s new scheme had started to make a difference. The report shows that workers at M&S suppliers in India, Sri Lanka and Bangladesh, despite efforts, continue to be paid poorly, forcing them to live in abject poverty, sharing slum housing and often working illegal levels of overtime – up to 110 hours a month over contracted hours. 60% of workers interviewed were struggling with mounting debt just to meet their basic needs. In Sri Lanka workers interviewed were paid an average of £3.23 a day, including overtime (a ten hour day). In months with high production quotas workers would be made to work 100 hours overtime a month, twelve hour days, 40 hours over the legal limit. Often workers lived in small rooms, 3x3m, shared by two or more workers. 75% of workers did not have running water or access to a tap, and most were sharing an outside toilet with 10 or more others. In India workers reported food and education expenses were difficult to meet on their wages, with one worker stating: “Our income is not enough. We don’t buy eggs, meat, fish or fruits because of high costs”. I am in debt by around 1000 taka every month because I need to pay for groceries and supplies on credit...Buying on credit feels like a disgrace. I need to find work at a factory with a higher salary. If my factory increased the wage I would stay, but right now it is not enough. I just want to be able to support my family. Our investigation into H&M’s living wage promise was less conclusive. We sought out H&M strategic suppliers in Cambodia to analyse their wage levels. Wages had increased, but not enough to meet a living wage level. In some factories, piece rate systems had been put in place causing workers to skip breaks, and leaving them exhausted and prone to regular illness. Average take home pay came in at $187.97 a month (£123.71) but workers estimated they needed $230 a month to live with dignity. Certain assumptions in M&S’s scheme were clearly not overcome. Like the fact that they are one of many brands in all their supplier factories, and yet were trying to work alone on this scheme. And the fact that their method to raise wages largely relied on trying to improve ‘efficiency’ at a factory level as the main way of increasing wages (which aside from the fact that workers should not be made to work twice as hard to improve their pay, has been shown repeatedly to not increase wages that much). A failure to engage with unions, and to be open about their scheme and how workers could be involved in making it a success was probably also at the root. M&S has made collaboration on the living wage a key priority for its Plan A from 2015 onwards, but we hope this will mean that as a brand they make an attempt to have a significant impact on the lives of the workers who make their goods, not just talk about it. H&M’s process has not yet failed. But we would urge them strongly to consider the reasons why the M&S scheme didn’t get off the ground – a reliance on ‘efficiency savings’, a failure to act collaboratively, and a failure to be open and transparent about progress. Although a lot of noise has been made by both H&M and M&S about their intention to improve wages, there has been little sign that this is actually making a difference to workers. Consumers can be forgiven for not knowing this fact given the sheer amount of ethical marketing put out by both brands; marketing that is rarely backed up by verifiable facts. Even relatively informed consumers are led to assume that ethical marketing must be based on some amount of genuine change. But in both cases, the scale of the communications operations in retail countries, compared to the impact or scope of the ethical initiatives they refer to, is, in our opinion, quite shockingly disproportionate. There is a clear need for greater transparency to ensure company commitments are backed up by fact. It is not sufficient for companies to be able to make claims about key human rights issues without supplying the quantifiable data that allows these claims to be independently checked, and for workers and consumers to hold them to their promises. Companies must publish, not only supplier lists, but audit reports, and other important data such as wages paid per supplier by grade if they are to make public statements about performance on wages. Experience from other sectors shows that providing credible information at all levels about product supply chains stimulates strong accountability and engagement from external parties. This is a vital part of ensuring change actually happens where it matters: in the lives of workers.